We have begun researching the curatorial work of Francis Quirk while he was at Lehigh University. 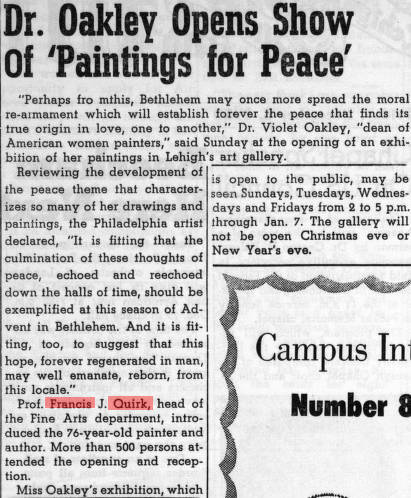 After his 1950 arrival and an initial show of fifty of Quirk's own works, he hit the ground running with an exhibit of the work of Violet Oakley. Oakley was the first American woman artist to receive a public mural commission. She is best known for her work at the Pennsylvania State Capital in Harrisburg. We excerpt below from her biography on the Mary Baker Eddy Library website and added a bit of information we gleaned from other sources. Violet Oakley (1874-1961) is now widely known for her talents as an illustrator, stained glass designer, manuscript illuminator, portrait painter, author, and speaker. This remarkable woman gained prominence as an artist at a time when women’s artwork was generally considered inferior to that of men. Oakley was a prolific illustrator. Her images, appearing in prominent magazines, helped promote women as confident and educated. But perhaps her most widely known accomplishments are as a muralist; she was the first American woman to receive a public mural commission and proved that a woman could not only succeed but create masterpieces in a medium dominated by men. Grand themes of the quest for peace and freedom, undergirded by vigilance and diligence—two qualities she greatly valued in mankind’s quest for peace—resonate through her works, which take on a number of different styles, including Pre-Raphaelite and Art Deco. Born June 10, 1874 in Jersey City, New Jersey, Violet came from a family of artists, including both her grandfathers. When she was 21, the family traveled to France, where she was inspired by her exposure to works of the great Impressionists. She attended the Académie Montparnasse, studying with the painters Raphaël Collin and Edmond Aman-Jean. When her family returned to America, she studied at the Pennsylvania Academy of the Fine Arts in Philadelphia, the city that would remain her home for the rest of her life. 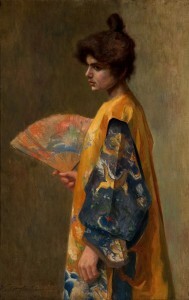 It was after her sister Hester began studying illustration at the Drexel Institute, and urged Violet to join her, that Oakley became a student of famed illustrator Howard Pyle, who recognized her talent. Under his instruction she blossomed. In 1902 architect Joseph M. Huston chose Oakley to decorate the new Pennsylvania State Capitol in Harrisburg, “purely because of her immense talent.” Oakley invested a great deal of time researching for the assignment, traveling to Europe and delving extensively into the life of William Penn, who features prominently in her painting for the Governor’s Reception Room, The Founding of the State of Liberty Spiritual. In the years that followed, she was commissioned to paint murals for the Capitol Rotunda and for the Senate and Supreme Court chambers. In all, 43 of Oakley’s murals adorn the walls of state buildings in Harrisburg; they were painted over the course of 25 years. The murals can be viewed as a testimony to Oakley’s moral and spiritual ideals. Raised an Episcopalian, Oakley embraced Quakerism and its advocacy of equality and pacifism—two major themes in her artwork. She particularly admired William Penn’s utopian vision for his Pennsylvania commonwealth. Oakley was a prolific artist, and it is said that she worked up to the last day of her life. At age 81 she led a large group from Philadelphia on a tour of her work in Harrisburg. She was politically active, supporting the League of Nations, the United Nations, and Cold War nuclear disarmament. 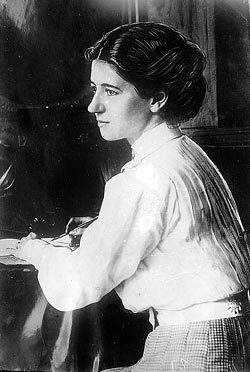 She is also known as one of the “Red Rose Girls,” who along with fellow artists Elizabeth Shippen Green and Jessie Willcox Smith transformed the Red Rose Inn on the Philadelphia Main Line into a communal art gallery, where the women lived and worked together—something quite revolutionary that pushed against the strict gender roles of the time. She was instrumental in establishing The Plastic Club in Philadelphia (to promote “art for art’s sake”), as well as the Philadelphia Art Alliance. She also was a driving force at Windmere Art Museum, an institution that Francis Quirk also was actively involved with. Violet Oakley died in Philadelphia on February 25, 1961. During much of her lifetime, she was considered the most distinguished woman painter in the United States. But her name fell into relative obscurity after World War II. By the early 1970s, however, there was an increased interest in the artistic styles she championed, and that has led to a deeper interest in her works and those of her colleagues. In 1977 Oakley’s studio in Philadelphia was listed in the National Register of Historic Places, as recognition for her multifaceted genius. If you are interested in learning more about this amazing woman or seeing her art, there is an exhibit at the Woodmere Museum of Art that includes some of her work. It is on display through January 21, 2018. What is exciting about this exhibit is how cutting edge it must have been for an all-male college to be highlighting the work of a woman. And for a new Professor of Art, Francis Quirk to make such a bold statement with his first major event, it certainly highlights a daring element in his character and may have positioned him as a bit of an iconoclast. Write up in the Brown and White about Oakley's Opening at Lehigh University.